Scientists at Winship Cancer Institute of Emory University have mapped a vast spider web of interactions between proteins in lung cancer cells, as part of an effort to reach what was considered "undruggable." The results are published online in Nature Communications. Many genes that drive the growth of cancer cells don’t have any drugs available against them. For "tumor suppressor" genes, researchers are often not sure how to go after them. When the tumor suppressors are gone, cells often become more deranged, but there’s no bullseye left to target. Exploiting the cancer cells’ derangement remains a daunting challenge, says senior author Haian Fu, PhD. 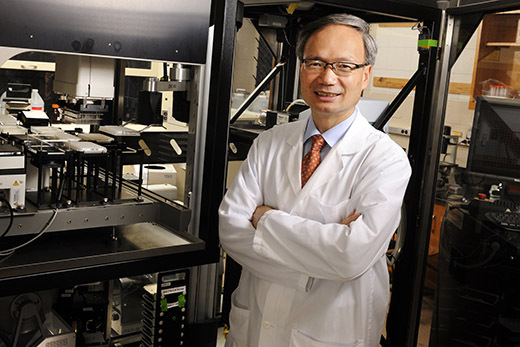 "Our approach is to place tumor suppressors in the context of a network of cancer-associated proteins and link tumor suppressors to drugs through a known drug target protein," Fu says. "In this way, changes in a tumor suppressor may be linked with the response of the target to the connected drug." One of the Winship team’s newly identified interactions -- a "thread" in the spider web -- suggested that palbociclib, recently approved against metastatic breast cancer, may work against cells carrying mutations in LKB1, through LKB1’s connection to CDK4, the target of palbociclib. Fu and his colleagues established a large-scale platform for tagging proteins with two different fluorescent molecules, introducing them into cancer cells, and then detecting interactions between the proteins. 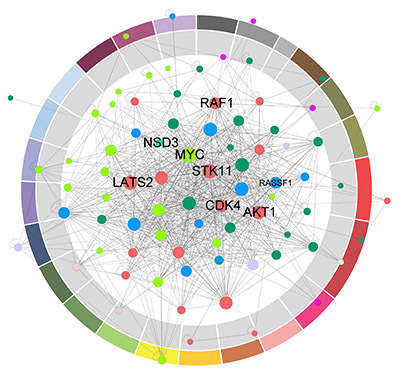 They call this network of cancer-associated proteins "OncoPPI." Starting with a set of 83 lung cancer-related proteins, the team detected more than 260 interactions that were not known previously. They tested the interactions several times, in different orientations, and in other lung cancer cell lines with selected interactions to establish reliability. More than 80 percent of the interactions the researchers detected could be confirmed by another method (GST pulldown). As an additional example to illustrate the utility of a protein interaction web, the team focused on the prominent oncoprotein Myc, which was also considered "undruggable." But the researchers could connect Myc indirectly through NSD3 to another protein called Brd4, against which inhibitors have been developed. Brd4 inhibitors are being currently tested in clinical trials. This finding revealed a new pathway Brd4-NSD3-Myc as potential targets for therapeutic intervention, Fu says. The OncoPPI research was supported by the National Cancer Institute Cancer Target Discovery and Development (CTD2) network (U01CA168449), lung cancer program project (P01CA116676) and Winship Cancer Institute (P30CA138292) and the Georgia Research Alliance, and the Emory University Research Committee. The clinical study of palbociclib is sponsored by Pfizer. Co-first authors are research associate Zenggang Li, PhD, now at Michigan State University, instructor Andrei Ivanov, PhD and Xiangya Hospital medical student Rina Su, now at Chao-yang Hospital, Capital Medical University in Beijing, China. Emory/Winship co-authors include Qi Qi, PhD, Philip Webber, PhD, Yuhong Du, PhD, Wei Zhou, PhD, Adam Marcus, PhD, Carlos Moreno, PhD, Lee Cooper, PhD and Margaret Johns, PhD, graduate students Valentina Gonzalez-Pecchi and Lauren Rusnak, and visiting medical student Songlin Liu. Collaborators from UT Southwestern contributed to the paper.